2017 is a Biennale year for Venice, but also a Damien Hirst year for the Italian city which will welcome a major exhibition by the artist. Spread across the two top contemporary art venues of the moment, “Treasures from the Wreck of the Invisible” is the come-back exhibition for Damien Hirst. It is the first time that the Palazzo Grassi and the Punta della Dogana (both belonging to François Pinault) will jointly host an exhibition. And it is the first time since 2004 that Damien Hirst will have an important solo show in Italy. Not much is known from “Treasures from the Wreck of the invisible”. 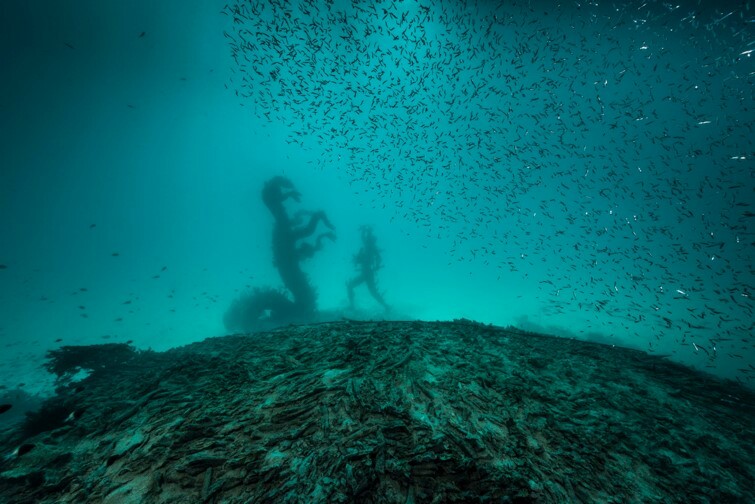 A couple of short videos published on the Palazzo Grassi website do not unveil more than a monster-like silhouette underwater. According to the New-York Times, the installation would be made of 250 items weathered by the aquatic environment. Their prices would be ranging from 400’000 USD to 4 millionUSD depending on the size and type of item. For this selling exhibition, the potential buyers will only be able to make their mind from pictures on a tablet. Damien Hirst has been working on this project for the past ten years. Since his 200 million USD “one man sale” at Sotheby’s in 2008, his market splurged and never fully recovered. A surge in his market however occured last year, when he announced his return to powerful dealer Larry Gagosian. “Treasures from the Wreck of the invisible” will open on April 9 and will run until Dec.3, 2017. Photo Christoph Gerigk, © Damien Hirst/Science Ltd.